I want to make one thing clear before I start this week’s diatribe against God-haters who have such fear of Christmas. One might think that as I write week after week about politics and the churches’ involvement I am anti-church and just want to make it the ineffective building down the street that consumes community services and pays no taxes. Quite the contrary. 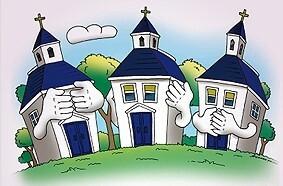 I put much faith, hope, and strength in our churches. I believe that if our society is to ever regain its moral compass it will have to be the church that initiates the effort and takes the leadership position. Government has not and cannot do it. The basic moral fiber of our nation has been torn apart and unfortunately the government has been a major contributor. It’s as though our legislators went through the Bible and tried to create laws that were counter to every Godly principle it espouses. Self-responsibility, respect for life, God’s purpose for male and female, family dissolution, welfare, rules for a moral society, ignore/rewrite of the Constitution, etc. only to name a few. But then the US government wouldn’t want the god-haters or the FFRF to get a step up on it so the bureaucracy joined in on the attack. In Salem, Virginia, The Veterans Affairs Medical Center implemented a ban on Christmas trees and religious Christmas carols in the public spaces of the hospital. The trees it claimed deemed to promote the Christian religion and would not be permitted in the public areas for the year’s celebration. [“Salem VA Medical Center Bans Christmas Trees as Holiday Decorations”, LIN Television Corporation, November 20, 2015]. Employees were warned that “public areas may only be decorated in a manner that is celebratory of the winter season.” [Ibid]. Candy canes were in; Baby Jesus was out. The VA administration even went so far as to tell the staff the kind of music that was permissible to government standards. [Ibid]. And to get into ‘full killjoy mode’ the VA banned visiting entertainers from warbling any Christmas carol in which the words Christ or Christmas were included. Pastor John Sines Jr., Rock Pike Baptist Church in Forest, Virginia, did not take a liking to the new rules. His group just wanted to honor and entertain the veterans. Unlike the leadership in many of today’s “PC” churches, the good reverend told the VA that he was not going to abide by the rules. He let the VA know that his group wasn’t going to be bullied into the VA’s way of thinking. His comment,”We’re rednecks. We don’t have no problem with standing our ground.” [John Sines Jr., in communications with Todd Starnes, November 2015]. He said he did not want to cause trouble, he just wanted to do what the Constitution allowed him to do. “I have a Constitution that protects my freedom, and I have a God who said He would protect me from everything else.” [Ibid]. It wasn’t long before the VA had to contend with outraged employees, veterans, and local townsfolk. A compromise was reached and the invitation was reissued to Pastor Sines’ group. Christmas trees would once again be permitted as long as other faiths could be represented. [Danner Evans,”Salem VA Hospital Decides to Decorate With Christmas Trees After Meeting”, WSET News, November 20,2015]. Administration officials cited VA Directive 0022, titled “Religious Symbols in Holiday Displays in VA Facilities”. The display “cannot favor one religion over another, and must convey primarily a secular message.” [Ibid]. So even if the 25th of December is a Christmas date, one must be able to celebrate whatever they want on that date…only makes sense in a “PC” world. The federal government may cite VA Directive 0022 for its definition of Christmas, but I prefer to cite the Holy Bible…Jesus is the reason for the season. Christians can win if they only have the fortitude to do so. Tell the folks at Cornell University what Christmas is the reason for. They are worried about “inclusive seasonal displays”. [“Inclusive Holidays at Cornell”, www.wsj.com, December 23, 2015]. That’s academic code for ‘Christmas decorations’. Students were warned that some “winter holiday displays” are not consistent with the university’s “Commitment to diversity and inclusiveness”. Among the items on the ‘naughty list’ are nativity scenes, angels, crosses, and mistletoe. [Ibid]. Why mistletoe? The guess is that the university didn’t want students spreading ‘Christmas cheer’. Anyway they ditched the Baby Jesus right along with a hemiparasitic plant. Students were reminded to use an inclusive approach to celebrating the holiday season, “focusing on the winter season rather than a particular holiday. Trees should be decorated with snowflakes and other non-religious symbols”. [Ibid]. For some of the students snowflakes were probably most appropriate. For the sake of inclusivity, and to make everybody happy, is Cornell going to serve pulled pork during Ramadan? Not to be outdone the University of Missouri banned all holiday decorations. Susan Even, the student health center executive director, wrote, “I’ve decided that holiday decorations will not be displayed this year. Our mission is to provide a safe, comfortable place for all students to receive their healthcare. Without meaning so, some of the holiday symbols that we may display could contradict that mission.” [Ashley Rae Goldenberg, “EXCLUSIVE: University of Missouri Student Health Center Staff Banned From Decorating for Holidays”, Media Research Center, December 15, 2015]. I can’t remember the last time I felt consternation over a Christmas tree. Further, this decision was an effort to show kindness, warmth, and compassion for all students. [Ibid]. I guess that means no twinkling lights or sugar plums in the safe spaces for the ‘kiddies’. Crying towels and coloring books are permitted. While American universities and government entities try taking the jolly out of holly, as Christians we need to take a stand. Silence will get nowhere. What can we do? – Resist. This is where civil disobedience comes in real handy. Test the limits. Force the institution or work place to draw a line between what is ‘holiday’ and what is ‘Christmas’. Poke the bear in the eye with a stick. Do red and green ornaments pass the test? What about star shaped cookies delivered to your child’s classroom? Gift wrapped presents? Angel decorations? Three kings? Your ugly Christmas sweater? Offer a ‘Merry Christmas’ to co-workers in the morning and in the evening. Play Handel’s Messiah at your work station. Persistent irritations will have their effect on bad policy. Never let the secular world silence you. If they put up a wall, go around it. Force them to spend time defending their silly rules. In the meantime, enjoy yourself. – Make a frontal assault on these bogus restrictions. Push back on the idea that your First Amendment rights disappear at the door of the workplace or school campus. Behind the scenes co-workers will rally on your side. – Most of all, keep your Christmas cheer. The joy of knowing Jesus personally is the most persuasive argument of all, and that light will shine. Be a happy warrior…even if a thunder storm knocks your computer off line. Next week we will start to take a look at what it is going to take to save the freedoms that millions have fought and died for and that some today are willing to give away for the political promise of a ‘good life’ free of personal responsibility, free of education debt, free of necessity to plan for the future, free government child care, provided nice housing for all, and no need to risk life to take a stand for what is right in God’s eyes. Don’t believe it. The evil in man will not let it happen. Greed, envy, hate, and lack of dedication to anything except personal pleasure will assure that.